I hope to get some testing done on my second prototype. It can be used as the base of a TChar stove. The Peko Pe TLUD project in Zambia is going well.
" The main principals for our projects I will call it community based participation both for fuel and for stove productions. Utilization of local resources with other words.. The Peko Pe is designed for production by local tinsmith with the tools they might have. They only need a template and a model; they have the knowledge how to make it.
" First of all we discuss the need of changes, and then on the fuel side we start up with registration of alternative biomass for fuel for briquetting, energy forestry for fuel production. We always start with the fuel .to be sure there is sufficient quantities and to an affordable price. "The charcoal business, which represents about 15 % of the adult population, has to be involved from an early stage of the project. All kind of activities on the household energy sector will in one or another way have an influence of their business, and with biochar we don’t know what will happen, but that is one of the ting we will try to find out. Any how for the charcoal business it is just to change from charcoal to alternative biomass for household energy. "The energy loss by production of biochar for soil improvement is almost equivalent to the energy needed for the farmer to cook if you include the African way of thinking time is coming not like by us time is running That is a big difference. A household need about 2,7 kg charcoal a day for cooking. Form about 10 kg of dry wood you will get 2,7 kg of charcoal for one day cooking and no biochar. From .10 kg of dry wood you will get 10 kg of woodchips and that will be for 2 ½ day of cooking into a TLUD-ND. and about 2.7 kg of biochar. The pilot project will tell us if this is right or wrong." Energy forestry using just the sprouting every year can give up to 10 ton wood per ha a year, easy to cut to appropriate fuel for TLUD-ND’s or other types of FES. By adding some biochar to soil of bad quality 20-30 % increased yields can be obtained, which will give more food, more household energy, more jobs, better economy, better health for women and children and saving the forest. It can probably be as simple as this and is that not some of what we are looking for and need? We know some changes have to take place on the household energy sector and we have to start somewhere. Why not start with small scale farmers on sandy soil, and from there develop the new household bio-energy strategy for developing countries. Probably also with the charcoal business, they have the whole infrastructure intact and can easy change from charcoal to alternative biomass like chopped wood or pellets from agriculture and forestry related waste. " This is a pretty straight-forward, efficient wood cooking stove, with a rest in the front for loading stick wood. It's pretty nice looking, and they've worked with Oak Ridge Natl. Labs to create a durable combustion area. It's got a couple of neat accessories. The one on the picture above is a flexible pot skirt. Pot skirts do a wonderful job of increasing heating efficiency, but they can be hard to implement because not all cooking pots are the same size. 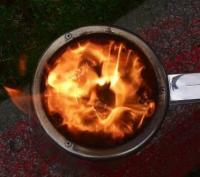 This solves that problem simply, and it looks nice which as we know from user feedback is critical to stove success. 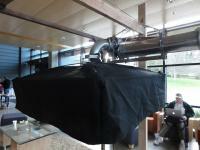 They have a chimney attachment which adds another "burner" to the stove, and helps vent smoke more efficiently. Apparently this is all the charcoal cooking stove. It is designed to be one of the cleanest burning stoves available. At first, I mistook the tall top part to be a cooking pot, but instead it is part of the stove. 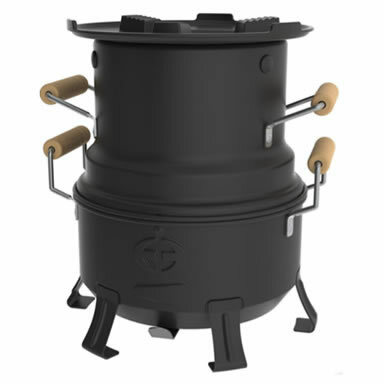 According to the instructions, the user needs a combination of charcoal and wood sticks or chips, that are loaded into the bottom of the stove, then the upper part with the pot skirt allows the stove to burn more efficiently. There are attachments for the other version of this charcoal stove that allow for grilling. This one seems more optimized for pots. save energy, cook more food. Avani charcoal stove http://avanicharcoalstove.blogspot.com/ is designed using the most common empty oil tin cans (15 liters) available in parts of India. 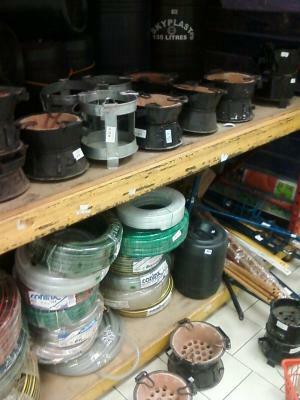 Steel mesh, rods and a forged iron grate are also used. This stove can be made with less skills. The steel wire mesh used inside, protects the tin as well draws in air. Other liners like clay, and any other material can also be tried. Recently trained women and youth in its production at Avani - an organization at Berinag, Pittoragarh District, Uttarakhand (Himalayas), India. Here the pine needle charcoal briquettes are used. 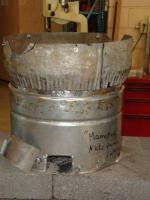 This stove has some common features of My Home Stove 2. http://myhomestove2.blogspot.com/ This is light weight, requires less skills to make it, convenient for adoption. The ETHOS Stoves Conference was last weekend, and it included demonstrations by some of the stove makers and manufactures, with the opportunity to talk to the people using and inventing the stoves. Here are some of the stand-outs from the demonstrations area, click on an image to view it in a larger size. The Shark Stove presented by John and Flip Anderson. Notice the even cooking on the pancakes, that even heat is partially due the ceramic shark teeth construction just under the cooking surface. This is primarily a stick burning stove with both a plancha (even cooking surface) and pot rests. Pamoja (http://www.pamoja.net/protree_jatropha.html) and Jet City Stoveworks ( http://jetcitystoveworks.com/ ). Abely demonstrated by David Otto. Paul Anderson dexterously burning Jatropha seeds (out of doors) in the Woodgas Stove ( http://woodgas.com/bookSTOVE.htm ) designed by Tom Reed. This is a light weight gasifying stove (minus the pot rest in the picture) that uses a small electric fan. 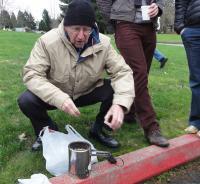 Boiling water in the Charbelle, presented by Peter Scott. The Charbelle is a Charcoal cooking stove designed by the Burn Design Lab ( http://www.burndesignlab.org/our-stoves/ ) for use in Haiti. This stove features an abrasion and thermal shock resistant ceramic liner surrounded by sheet metal cladding. 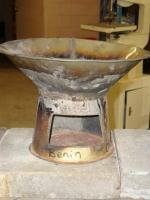 The stove is currently being mass produced and sold in Kenya. The stove has been very well received, earning top marks from consumers. Ryan with StoveTec was demonstrating the StoveTec Stove ( http://www.stovetec.net/us/ ) an Ashden Award winning cook stove that can either be used with stick wood or charcoal. 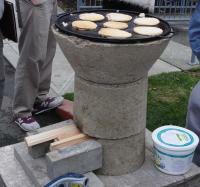 The institutional version of the StoveTec Stove for use in schools and other organizations, has an attached chimney and an a pressure cooker version. The pressure cooker is useful to shorten cooking times, and the fuel consumption, when cooking beans and small grains. The Nomad PrePac ( http://www.preppac.net/ ) Bio-fuel Camp Stove burning stick wood. 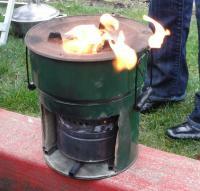 This is an ultra-light stove designed to burn small amounts of fuel for camping or for emergency preparedness. 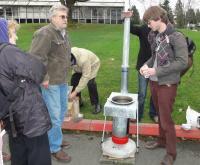 the PEMS emissions testing was happening at ETHOS (of course), Larry Winiarski is in the background in these pictures. Most adopted stove by poor, tribals and farmers in parts of Andhra Pradesh, India, Already facilitated 1500 stoves and the demand is growing every day. We need a high turn down ratio. To bring water and foods fast to the boil, we need high power in the heat-up phase. therefore needs to offer the opportunity to turn down the power output drastically. We need to reduce heat losses to the bottom and to the side of the stove. of char used, it is important to reduce the heat losses to the other directions. heated rebounding plate, taking some heat back into the char container. Side of the stove: double wall with air in between for insulation. We need to maximize heat harvest from a given amount of charcoal. A vertical spacer in the center of the charcoal container (Lanny Henson’s pig tail”) seemed to increase the availability of air for charcoal combustion. Additional draft (e.g. forced air) may increase heat generation per time unit. However, this may also increase CO emissions and reduce efficiency of char use. 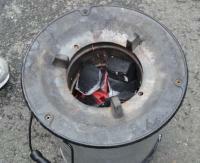 Secondary air to burn off the CO in a gap between the charcoal and the pot may provide additional heat. However, for this to be beneficial it may not impact on the surface area available for direct radiation from the charcoal to the pot and should not cool down the air in the gap (well preheated secondary air). We need to maximise heat transfer to the pot. Generating as much heat as possible out of a given amount of charcoal is one step. transferred into the cooking pot. 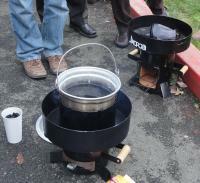 “Sunken pot” concept seems to provide best results in terms of heat transfer (Henson stove). Unfortunately, in real life this might not be possible in many work environments. 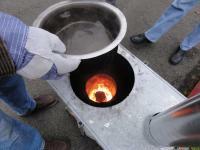 Best heat transfer is NOT achieved if the pot rests on the char. Optimum is about 1inch away from the char, not closer than that. For Simmer, this could increase to 2-3 inches. A skirt is highly important to shield the gap area between the pot and the char against the influence of wind. The gap between pot and skirt should bedetermined. Add space between the charcoal grate and other stove parts: Lift the charcoal grate slightly off the bottom of the stove and increase the space to the sides of the stove. Limit the places where the hot grate can conduct heat to other stove parts. Add a deflector plate between charcoal chamber and the stove bottom to radiate heat back upwards. Insulate the stove bottom to prevent heat loss through the bottom. Insulate sides of the stove. Regain heat through air circulation (air cooling of stove) by passing air through heated stove parts thus preheating air entering the combustion system. This can be by passing primary air through the deflector plate below the grate and/or secondary air through a gap between double side walls of the stove. air supply to the charcoal grate. making more holes in the grate. adding a ‘Henson pig-tail’ vertical air-pass through the charcoal bed. Do not pile the charcoal up too high, as this will restrict air flow through the charcoal bed (this is influenced as well by the shape and particle size of the charcoal chunks). a subsequent step from CO to CO2. will increase energy output and reduce toxic emissions. Charcoal radiates heat but there is also considerable convection of hot flue gases. the view factor of the charcoal seeing the pot). Fifty two high energy participants attended Stove Camp this year at Colgan’s Island, camping near the river, making and testing stoves, and listening to Fred’s Big Band harmonize so beautifully. Fred and his volunteers cooked breakfast every morning and dinners at nighttime parties on Rocket and TLUD institutional stoves. Nick Salmons from International Lifeline Fund made a very successful Haitian charcoal stove that was voted “Best in Class” by his peers! 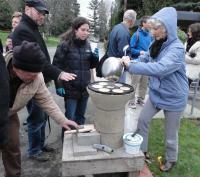 Stove Camp provides a venue for a gathered scientific community to advance knowledge of biomass cook stoves. 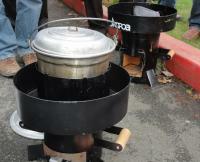 Participants made new stoves and tested them daily for fuel use and emissions. 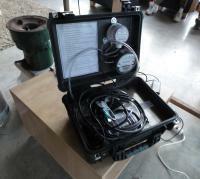 Every morning the test data was shared and new stoves were constructed. and mimics a typical cooking task, cooking rice and beans. Charcoal stoves were constructed that used less fuel and produced less carbon monoxide compared to traditional Haitian stoves. 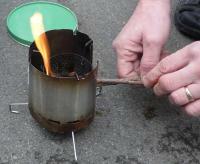 See the attached Stoves Camp Report for details of the tests, the interesting findings about the optimum charcoal to use for each stove, and pictures of the stoves tested.